The nuanced rules of baseball can baffle even the most seasoned fans. And for new ones, there is much to learn. In the Baseball Field Guide, graphic designers and baseball devotees Dan Formosa and Paul Hamburger combine quick-reference text and crisp illustrations to demystify America's national pastime! Now updated throughout with the latest changes, such as the “Buster Posey rule” on collisions at home plate, the Baseball Field Guide explains every rule in plain English:•Rules that apply before, during, and after the game •Equipment specifications and field requirements •Duties of the coaches, managers, and umpires •Rules for spectators (yes, they have rules, too!) •The clearest explanation anywhere of the infamous Infield Fly Rule, and much more! 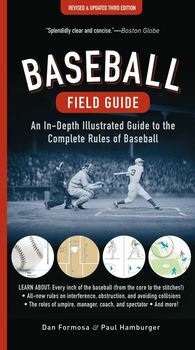 Now in a revised and updated 3rd edition—a wonderfully clear and comprehensive one-stop illustrated field guide to the rules of baseball Designed for quick and intuitive searches, this entertaining reference will help you understand every aspect of the game and add to your enjoyment of the sport.